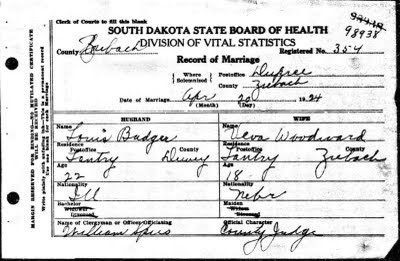 In my family, three Badger brothers married three Woodward sisters. 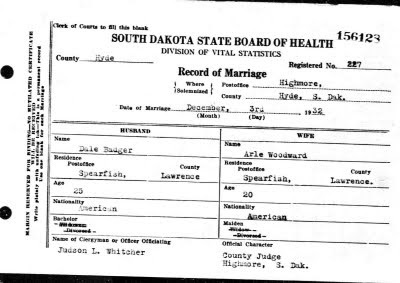 So, my grandparents married one another, and in addition, two of my grandfather's brothers married two of my grandmother's sisters. Hopefully that makes sense. They used to kid that they were the only two families in town. And honestly, that's probably not much of an exaggeration! So, the children from these unions were double cousins. They have different parents, but all four of their grandparents in common. My dad had three siblings, and eleven double cousins (although one of Lewis & Veva's children, Mabel, died in infancy). In technical terms - first cousins generally share 12.5% consanguinity. Double cousins share twice that, or 25%, which makes them as related as half-siblings. Pretty interesting, I think. They were quite close, of course. No matter which side of the family they got together with, their mother's or their father's, their double cousins were always there. I just think that is so cool. Sometimes I think I was born in the wrong generation. Well, then again, I do like modern technology. And wearing pants. 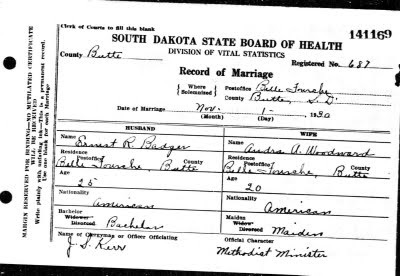 But I sure would have loved to be around for this, the wedding of my great-aunt & great-uncle. Unfortunately I never even got to meet anyone involved in this story. The day was beautiful and we had the noon meal at my Aunt Lena and Uncle Ed's. Then hurried back to my folk's home to get ready to go see the Judge Spees (I'm not sure how he spelled it but sounded like Spees). 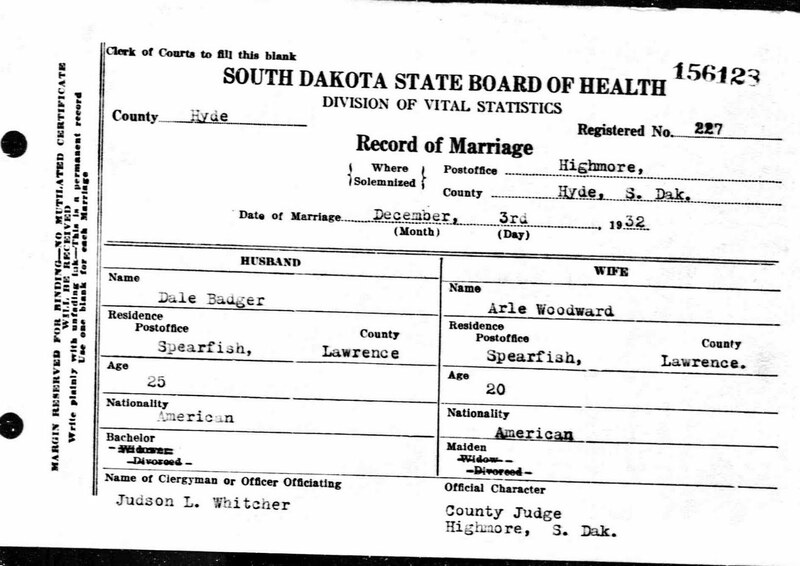 He lived on a farm about two miles out of Dupree, S.D. 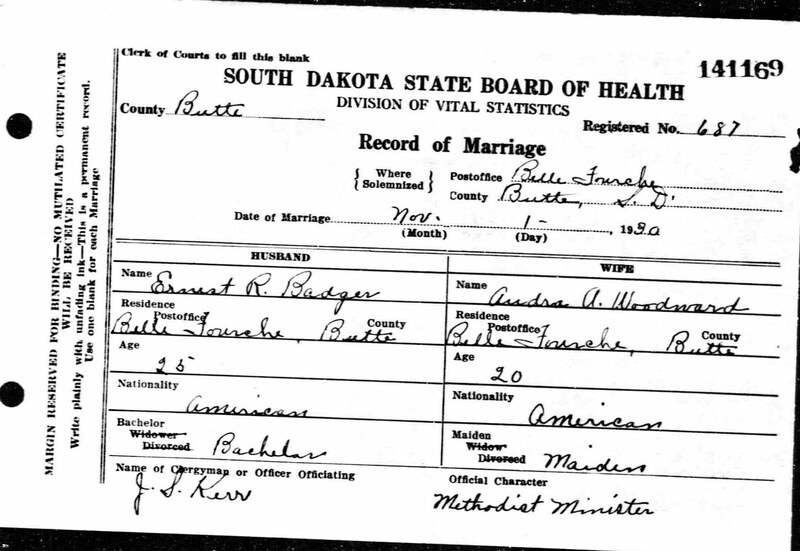 Lewis had gotten the license on Friday or Saturday at the courthouse and told the Judge we'd be there at 5:30 p.m. Babe, Otto and Mattie went along with us, in the folk's old Chevrolet touring car! We got West of the farm, just out of sight, when the car stopped suddenly! Babe said, "it's a halfmoon key in the rear-end". A friend, Zelma Davis, came by on her horse, she had been a school mate and friend of mine, we sat and visited. The men repaired the car and Zelma left on her horse. We went ahead about thirty feet and it broke again! Babe said, "that's it, we must go back and try again tomorrow!" Lewis said, "no, when I start somewhere I go there!" So, he took off on foot to a farm near by. Mr. Griffith had just come in from the field, he was a man, who, if he didn't work any other Sunday, would work on Easter. Lewis told him of our "break down" and Mr. Griffith said, "take this team and spring wagon and good luck!" So, we went on, but Babe decided to walk home, to let the folks know what had happened. By the time we got to Judge Spees' farm, he had given up on us, changed his clothes, and was at the barn milking. He came in, again put on his suit and performed the ceremony. Mattie and Otto were our attendants. It was 25 minutes of 10 p.m. --but we did it!! Then we drove back 12 Or 14 miles to my folk's. It was about midnight when we got there. We stayed there and the next day Lewis returned the team and spring wagon and took along a saddle horse to come back on. Babe and Otto repaired the car again! 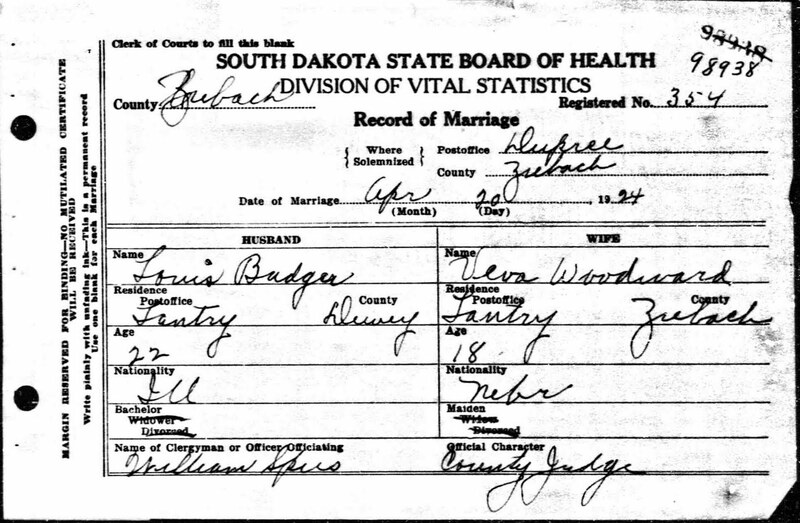 The next morning we started to Ft. Pierre to catch a train to Huron S.D., where Lewis had work. Of course Babe drove us and when we stopped to go through a gate about eight miles from home, the car broke down again!! A neighbor came along, taking his cream to Lantry, to catch the train, to ship it to a creamer. So, we hooked a ride, with our luggage, in the wagon with Mr. Sprague. Babe rode along to within a mile of home, then he walked. We got tickets, caught the train and went to Obridge, S.D. There we stayed at a hotel till 4:00 a.m. We had them wake us up, so we could catch a train to Aberdeen, S.D. Then we took another train to Huron, S.D. There were no country telephones then, so, Lewis hired a taxi to take us out to the farm where "Pop" Badger was manager. Lewis worked there till that fall I and I helped "Mom" Badger cook and wash for twenty men who worked there, on what was a Mennonite Colony farm before World War 1. We left for Lantry in October. Then I taught school at Little Bend, at a school that had "run their teacher out". I was to fill in until they found another teacher, but I quit one month before Arminta was born. Lewis was working for the Sutten Cattle Co., cutting water holes in ice and looking after cattle. That was quite a year but we were so happy - we had a shack to ourselves and were looking forward to our first child. *Babe - Jesse Woodward, Veva's brother. *Otto and Mattie (Albers) - Veva's sister Mattie and her husband. *Mom & Pop Badger - Omer & Bertha Badger, the father and stepmother of Lewis. Now is that a cute story, or what? It's almost April 20th....Happy Anniversary, Lewis & Veva. I can close my eyes and picture this. So simple compared to today and so beautiful. I, also, had a double cousin, whom I lost in 2010. I love her still more than my own siblings. She was my only sister. I cannot imagine how hard life was for these 2 sets of siblings when they started to die, but to have shared their entire wonderful lives? What a magical blessing.